The Breville BES870XL Barista Express Espresso Machine is an espresso machine that is packed full of features that make it one you should have on your list of espresso machines to check out. This espresso machine has features like single-wall and dual-wall filters, a thermo coil heating system, volumetric controls, and parts made of very high quality, that could make this machine the best one for you. This article will cover the key features that make the Breville BES870XL stand out in its market. Read on to find out why this espresso machine scores with the best of the category. Almost all products have some pros, as well as some cons. It is important to consider all of the great things a product has to offer. It is equally important to consider the cons. This will ensure you get the best product for your needs. Grinds beans a dose at a time with built-in burr grinder; fully adjustable for customized taste. Volumetric controls, with pre-set single and double shots. Gives gradually increasing pressure for more even extraction. Comes with all needed accessories. Grinds beans in under a minute for optimum freshness. Size is great for almost all home kitchens and office spaces. The Breville BES870XL is equipped with a 1600 W thermo coil heating system and a 15 bar Italian pump. This feature regulates the temperature for your espresso quicker than other machines that are in direct competition with it. Regulating the temperature faster makes for the richest flavor in your coffee. The conical burr grinder has an attached ½ lb. sealed bean hopper. The grinder has a voltage of 110-120 volts. It can be set to grind the amount of beans for your desired dose of espresso. This grinding action takes place in less than a minute, which means your coffee gets brewed when the grounds are as fresh as possible. The grounds lose freshness with every minute that goes by. Other slower grinders cannot give you the freshness that the built-in grinder on the Breville BES870XL does. The water tank is removable and has a handle for easy refilling of water. There is also a replaceable water filter, to help with water scaling, and to rid your water of impurities that can change the taste of your espresso. The water is very easy to refill through the top of the tank. Everything about this water tank is user friendly, to give you the most convenient way to refill your espresso machine. Also, the Breville BES870XL has a larger capacity water tank than many of its competitors. The Breville BES870XL has volumetric controls that let you select your volume size easily. There are preset selections for a single shot or double shot of espresso. The user can use this control to manually override the presets, as well. Another convenient thing about the volumetric control is it is capable of reprogrammable shot volumes. This is a convenience that many other types of espresso machines are not equipped with. This espresso machine comes with two different kinds of filters. The single-wall filters make it more difficult, but give a more experienced barista a tool to make the espresso exactly what they are trying to. The Breville BES870XL comes with both levels of filters, making it good for all different levels of coffee brewers. This machine has an attached steam wand that can rotate around a full 360 degrees. Having a wand that swivels all the way around, whichever direction you turn it, makes using it and cleaning it simpler than machines whose wands have limited motion. The Breville BES870XL packs a lot of punch, but does not need much space to do it in. The dimensions of this espresso machine make it ideal for almost anywhere. The measurements are 12.5 x 13.2 x 15.8 inches. This machine is great for pretty much all home kitchens, and any office space. Making espresso and espresso based drinks takes a lot of accessories. The Breville BES870XL is sold with all the accessories you will need to make your favorite espresso drinks, unlike many other espresso machines. The Breville BES870XL is pretty easy to use. With all of the key features mentioned above, you can set your machine to make your espresso exactly the way you want it. This machine has settings that allow you to tweak your coffee enough to make it perfect. The tweaking is all done through using dials or pushing buttons. It does not get much easier than that. There are even features that help make the cleaning process easier for you. There is a feature that drains extra water out of the filter basket, once the brew process has finished. This makes the grounds dry out, turning them into an easily removable puck. The only thing mentionable that is a downside for the BES870XL’s ease of use, is that it is only semi-automatic. There are machines that do just about the whole process automatically. While this is a downside sometimes, it also allows you to customize your espresso drink more than other machines would. 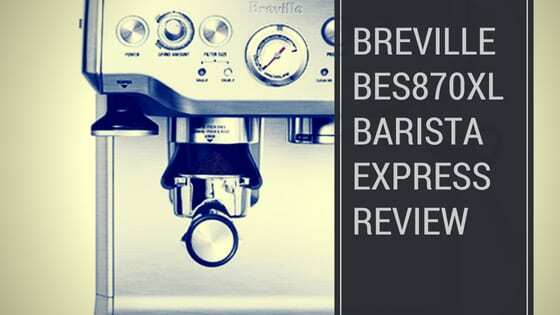 The Breville BES870XL is for anyone who enjoys espresso, and espresso based drinks. Whether you have experience with making espresso, or not, this machine is meant for whatever your skill level is. As mentioned above, it is easy to use, and to customize drinks to the drinker. One of the BES870XL’s key features is the set of filter baskets it comes with. There are 4 filters, 2 dual-wall, and 2 single-wall. The dual-wall filter baskets are pressurized, making them ideal for someone who is new to brewing espresso. The single-wall filter baskets are not pressurized. This allows you to experiment more with different grind sizes, and amounts, and tamping pressure. You can use the single-wall filters to truly perfect your espresso drinks, and your barista skills. If you are not someone who likes the bold flavor that espresso gives you, or you do not drink specialty drinks made with espresso, then the Breville BES870XL probably is not for you. In this case you may want to buy another espresso machine available on the market. Breville builds products to last. It is no different for this espresso machine. The BES870XL is made with high-quality parts. All of its parts are housed in stainless steel. The stainless steel will help you keep your espresso machine for a long time, and also make it easier to clean. There are non-slip tabs attached to the bottom of the machine to keep it from sliding around. This machine is pretty heavy. It weighs about 23 pounds. While it is fairly heavy, it speaks to the quality of the materials it is built from, so it is not, necessarily, something to see as bad. Like any other food or drink machine, the Breville BES870XL will have to be cleaned and maintained, in order to make sure it lasts as long as you want it to. The machine will need to be descaled sometimes. The process for this is quite simple, and is described with easy-to-follow instructions in the manual. It is done with a half and half mixture of water and white vinegar, no special cleaning solution necessary. It should be done about once a month. There is also a clean me cycle. It was mentioned above that the machine has a feature to dry out the grounds into a puck that is easy to remove. The process this is done with causes some water to store in the group head. Because there are coffee oils in there, sometimes a clog can occur. When this happens, a clean me cycle light will come on. This process is done through the clean me cycle, and is completed with a cleaning disc and tabs that come with your machine. Cleaning the grinder is quite easy. The cleaning kit has a brush that is meant for cleaning the grinder. This should be done periodically, on an as-needed basis. The steam wand should be cleaned after each use. This can be done with a damp rag, or cloth. Also, the wand itself should be blown out to ensure no clogs occur. The filter baskets and porta filter should be rinsed immediately in warm water. The filter baskets have little holes in them. Check to make sure none of the holes are blocked. If they are, just make sure to clear them with a toothpick or something similar. This will ensure proper water flow through the basket during the brewing process. Overall, the cleaning and maintenance for the Breville BES870XL is similar to other machines of its kind. Some of its features do make it a little bit easier to clean some of its parts, like the housing being stainless steel, many parts being removable, and the drying out of the puck for easy removal. Also, this machine is sold with a cleaning kit included, and has a convenient clean me light to indicate when a clean me cycle needs to be run. The Breville BES870XL Barista Express Espresso Machine is a great product for anyone who loves this kind of bold coffee. It is semi-automatic, so it is easy enough to use for the beginning barista, but has enough knobs and buttons to make the more experienced barista happy, allowing the user to choose the settings to make an amazing espresso drink, just the way they want it. This is a good, quality product, that does exactly what it was built to do, brew a tasty, fresh, quality dose of espresso, quickly and easily. It is great for every day use, and comes at a relatively low price to other machines that do the same thing. If you are looking for a good espresso machine, at a good price, here it is, the Breville BES870XL Barista Express Espresso Machine.